Posted on Mon, Mar 12, 2012 : 10:45 a.m.
Area native Jeremy Kittel, second from left, brings his band back to The Ark this week. Jeremy Kittel, best known around these parts as a local Celtic-fiddle prodigy when he was growing up in Saline—and then for earning a bachelor's degree in jazz from the University of Michigan in 2004—is presently in a period of transition. But that’s not new for this restlessly talented musician. Although he’s now only 27 years old, Kittel is accustomed to transitory passages. He studied classical violin “on and off until I was about 22,” he says, but received most of his local acclaim for his mastery of Celtic styles, and his regular presence at Celt-music events around the area. Then, in high school, he was drawn to jazz, and began “listening to a lot of John Coltrane and Miles Davis,” recalls Kittel, who brings his band (Josh Pinkham on mandolin, Tristan Clarridge on cello and Simon Chrisman on hammered dulcimer) to The Ark on Thursday. 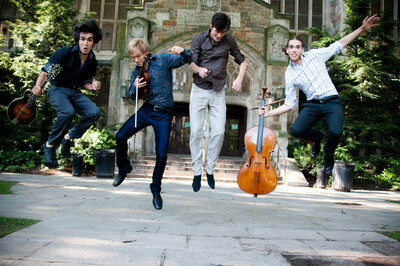 Who: Kittel, originally from Saline, first drew attention locally as a young violin / Celtic-fiddle phenom and later moved to New York, then Oakland, and joined the acclaimed Turtle Island String Quartet. What: Kittel and his band cook up a heady brew of Celtic music, jazz, world-music and blues, leaving plenty of room for improvisation. When: 8 p.m. Thursday, March 15. How much: $17.50 Tickets available from The Ark box office (with no service charge); Michigan Union Ticket Office, 530 S. State St.; Herb David Guitar Studio, 302 E. Liberty St.; or online from MUTO. “And the more I listened to jazz, the more I fell in love with it, so I was in this rare position for a violin / fiddle player, in that I was alternately playing with different musicians from these different genres—Celtic, jazz and world music. “Davis just displayed an incredibly range of humanity and emotions, and that’s what I am continuing to try and move toward,” says Kittel by phone from Oakland. His decision to earn degrees in jazz was partly inspired by his love for the idiom, but also because it was in a jazz program that he thought he would benefit the most in terms of learning theory, improvisation and composition, he says. Kittel’s last solo album, “Chasing Sparks,” was released in 2010, and showcased such newgrass / new-acoustic giants as Edgar Mayer (bass), Chris Thile (mandolin) and Mike Marshall (mandolin). Other top-drawer musicians who lent a hand were Tristan Clarridge (cello), Natalie Haas (cello) and a couple of Michigan artists with whom Kittel has often performed over the years—Tyler Duncan (bodhran) and Nic Gareiss (foot percussion). “Chasing Sparks” was grounded in Kittel’s Celtic-based fiddle playing, but also stirred jazz, bluegrass, chamber music, Eastern-European exotica and intricate Latin / African grooves into the mix. And he is presently at work composing and recording pieces for his next album—or, perhaps, albums. The work he’s producing now is heavily influenced by collaborating with so many different artists the last few years, from the above-mentioned aces who played on his last record to his Turtle Island mates to banjo player Abigail Washburn to the eclectic, band highly-acclaimed group My Morning Jacket. He co-arranged the string parts, and then played them, on Jacket’s latest album, “Circuital.” “I think the world of those guys,” he says. He’s also recently worked with the New Orleans-based funk-jazz group Galactic, as well as former Primus drummer Bryan “Brain’ Mantia on the music for the “Infamous 2” video game.